Moving on from that, when they announced this figure I was actually excited, because nostalgia and all that jazz. Plus the Sailor scouts already were like a magical girl sentai team! Right out of the box she was already impressing me. The entire outfit has a slight metallic sheen. It shows the most on the pink/blue, but the white has it as well. It really helps make the costume stand out from a generic white/pink/blue. Oh the details! While the hair gems on mine do have some paint error, the rest of it looks pretty good. The gold crescents and white on the boots is very clean, and the golden piece on the chest has some very fine detailing and paint application. The white lines on the blue portion of her outfit are all clean and crisp. Her hair is also pretty interesting, with it being a translucent yellow painted to give it a more flowing look. It's especially obvious in the tips of the ponytails. I think it's a fairly neat effect. Her articulation is weird. 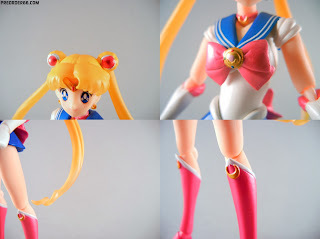 They gave her all single joints instead of the double elbow and double knee commonly found in the Figuarts line. They actually look more like Figma joints in their appearance, which isn't a bad thing because of Moon's slender frame, however does slightly limit her elbow and knee articulation. The ankles are on what seems like a similar joint to the wrist, giving them a huge range of motion. The wrists are a smaller version of the normal Figuarts wrist, so no restrictions there. Her torso joint is hidden by the pink bow, and another at the waist, by the skirt. Neither joint provides a huge range of motion, but they do move enough to do what you need. The skirt is a softer plastic that does hinder the hip joint, but as you can see by the picture, not by much. Her shoulders are on a very large ball, and you can see some unfortunate mold flash on her costume. This design works because it almost looks like a extension of her costume fabric. It's also a new design I can't recall seeing before. 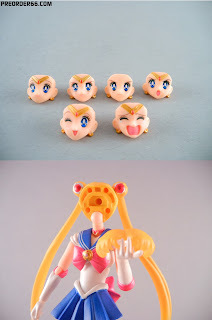 And hey, even her ponytails are articulated. Just a simple ball joint the easily pop into and out of the head buns. This is preferable than them breaking because they are long and would otherwise get in the way. FACES!!!! 6 of them! WOW. While 4 of them is the standard pack in, the winking and crying faces are first run exclusives. I really love that she has so many options, being an anime character who is pretty damn expressive. I do think the 2 added in are pretty great, and add lots of personality, the main 4 do a good job of conveying emotion. Swapping them is pretty simple, you pop off the front of the hair, and then just a easy swap. Also Sailor Mercury is in people's hands now and they seem to be swappable with her, providing even more options. I really dig the determined face, and how it drastically changes her personality. The yelling face also makes me happy. Hey it's a Moon Stick! The detailing on this is pretty great, even though it's a fairly simple accessory. The paint is all pretty clean, and even the small gems are painted. This is also a Moon Stick after a slight power up. The changed between the two are subtle, with a crystal added and a bit more paint near the center. Both have good paint, even though this thing is tiny. The star carved into it is barely even noticeable from normal perspectives, but as you can see it is pretty crisp this close up. Her Moon Tiara throwing weapon is represented by this semi translucent disk. All in all a pretty decent effect, and faithful to the series. This is also the only time to use the Tiara-less head. It's attached to her hand, permanently. Not a bad way to make something like this. Any other option would have it falling off all the time, I think. It's a solid way to do a throwing disc weapon. Maybe a second packed in with a energy trail would have been cool, but I dunno. I really love the winking face. It gives off so much personality. Onto her other accessory, Luna! Neat. She's a talking cat that advises Sailor Moon, and is really a millennial old human/alien thing and wow it gets way confusing let's just focus on this cat. The body is one solid chunk, made of a semi-rubbery plastic. It stands up on it's thin legs, sometimes, It does like to fall over, maybe prop it up against something. The head is articulated, it can turn. It's a great accessory to Moon, one that would have been a bummer if it wasn't included. Yup, that head pops right out. All those hands, you get a pair of fists, a pair of splayed open hands, and her transformation pose hand. The only hand meant to hold the weapon is the semi open fist for her right, and a semi relaxed open hand on the left, to go with it. She has a pretty decent amount of hands, though more right than left. The hands are on a new wrist peg as well. Instead of the ball, it's a small peg. I worry this might break, as some of the hands are pretty tight initially, but it fits with the theme of thinner joints on this figure. She keeps her height, which is slightly funny because she is supposed to be a high school girl, and actually inches out Ichigo here. She also comes with a stand! yay stands! This is not a first run bonus, this is packed in with every figure, and that is always a plus. The design on it is a nice pink, fitting for the character, and is in the shape of a heart. Awwwwww. The stand arm is different than the normal tamashii stage arm, because it's made of segments, and the grip is thinner. This all works well, because of Moon's thinner frame. But it does a solid job of holding her up, so hey, it functions as intended. I do find it odd that when used like this, the heart has the name facing the wall. I don't know if mines messed up or this is how they are. Either way, weird choice. That semi relaxed hand, in action! She needs some good monsters to terrorize her. These will do. Boy she looks tiny next to these guys. 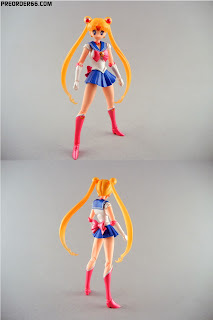 Sailor Moon is a really fun, solid Figuart. She is expressive, and is loaded with accessories. 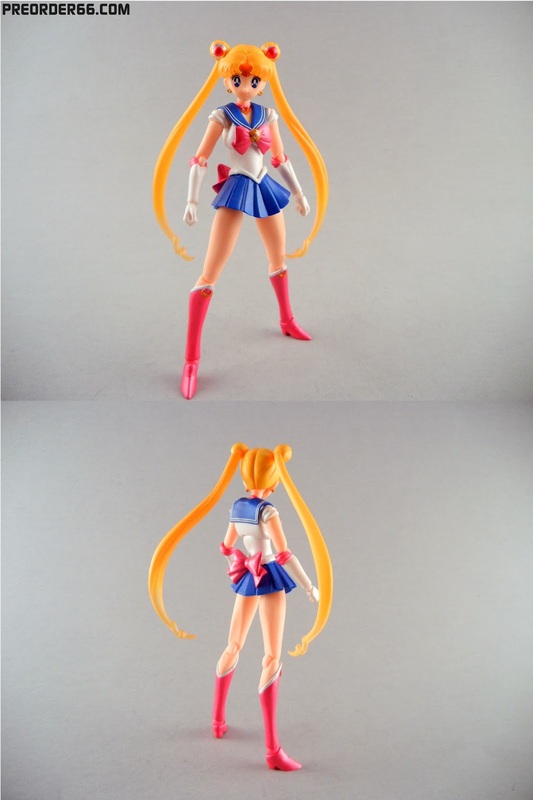 Having a female Figuart that isn't a sentai memeber is few and far between, and this is the new standard for the rest of the Sailor Scouts, so they had to get it right. The pretty cure Figuarts were much older and more of a disappointment. So it's happy to see that they kind of nailed it. Once again they are making toys of my childhood, and that hits me right in the nostalgia. Superpowercollectables had her, but they sold out. Lots of other online stores have them in stock, as she is a standard bluefin release. This figure was provided courtesy of Tamashii nations/Bluefin. great review, and i agree on all fronts. One of the best figures released this year. Im seriously considering it for the top spot. Careful Adam, this chick will go all magical on you......but I think you want that. I have been so tempted to pick this figure up, and I think this blasted review has pushed me over. Oh, and the disembodied faces will visit me in my nightmares. Sailor Moon definitely got the better deal on accessories. Mercury is a bit lacking, but is otherwise pretty much the same. Frigin' love how they made the goggles work on her, though. ..................................................................This is a bootleg. You took a photoset of a bootleg. ...except that it is not. This came to Ichabod directly from Bluefin/Tamashii Nations as a review sample. Now apologize and stop being a bad internet person.